PRAYER PROMPT ••• I have to admit, I’m struggling this morning. I have to go to the DMV and I’m distracted and so ready to have this crossed off my list. I think the only people who actually like going to the DMV are 16-year-olds. We all have things on our to-do list that we dread. For me, I’ve put this off for a long time, but my license expires in less than two weeks and I’ve run out of ways to procrastinate. I don’t think it’s a coincidence that on the morning I have to do something I’ve been dreading, my Scripture reading is the story of Jonah. I wrote about this a year ago… the story of Jonah’s disobedience is legendary, but unlike the Sunday School version that has a freshly-spit-out-of-the-whale Jonah happily skipping off to Nineveh, Jonah went begrudgingly. He eventually obeyed, but only after trying to hide, and then, he was actually angry at the Lord for offering grace and mercy to those people when they repented. When we know we need to do something and put it off, the sense of dread lingers and makes things so much worse than if we’d just obeyed the first time around. Parents, have you ever ended up in an argument with a middle schooler who would rather argue for 45 minutes about unloading the dishwasher, rather than spend five minutes actually unloading the dishwasher? Thankfully, our Heavenly Father has a better temperament than I do, but still, when He tells us to obey, He expects us to obey. Doing it begrudgingly and with a chip on our shoulders isn’t really a great model of obedience. Parents know this kind of obedience isn’t really what we have in mind when we tell our kids to do something. We want to be obeyed quickly and with a good attitude. But as aggravated as we may be with our kids, we’re as guilty. 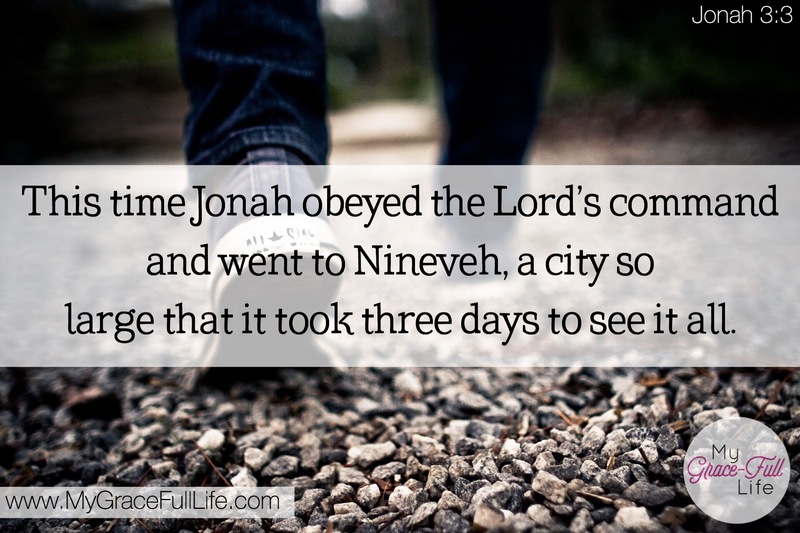 It’s not Jonah’s obedience I relate to… it’s his reluctant obedience. Today, as you pray, ask the Holy Spirit to instill in you a willingness to obey. Ask Him to help you be cheerful and eager in your obedience to God, knowing that whatever He asks of you, He will equip you to do. Yes, I’m praying for you in the early 8AM hour! In some way, I’m sure we all relate to your description of reluctant obedience…but the joy that we can find in eagerly obeying and being equipped is amazing! Thanks! Still praying! Thanks for praying, Carol! I got my license renewed!!!! WHEW!!!!! It wasn’t expired quite yet, but it was WAY overdue since it was still in my maiden name and I moved quite a while ago. Yes… so true! I’m with you. Hugs!